Are you ready for some fun visiting with the men and women of the Public Safety agencies in our area. 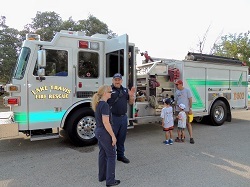 Interactive Demonstrations, safety information, food, music and activities for all ages. 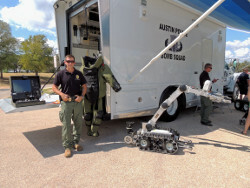 These are the people with their equipment and service who protect and service our community and communicties around us. 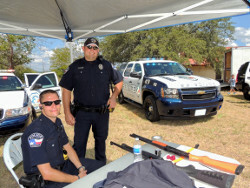 We expect about 20 area agencies to participate this year. 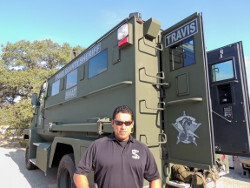 September 27th, 2014 from 10am to 4pm at Lake Travis Elementary School located at FM 620 and Kollmeyer in Lakeway, Tx. If you would like to obtain booth space at this event, we welcome your business or service organization. You may file an application on-line right here. Keep in mind this is an application for space. It does not guarantee a booth. If we already have a business or service organization that duplicates a prior application, the application could be rejected. If an application is rejected, a refund will be issued. Payment must be received within 10 days of application. Sponsors of this years event will be included in promotional materials prior to the event as well as during the event. Donations can be in the form of money, materials or services needed for the event. Bronze sponsor - $100, gets logo on signs at event and a vendor spot at the event if desired. Platinum Sponsor - >$1500, Gold + banner placement preference and as much booth space as desired at the event. Paper form here and mail to us at the address on the form. In either case, we would appreciate any cash donations be mailed to us at the address on the forms.